Yes, it should be every day, but it’s still fun to get out and cheer on or be cheered on in recognition of the general awesomeness of riding a bike. 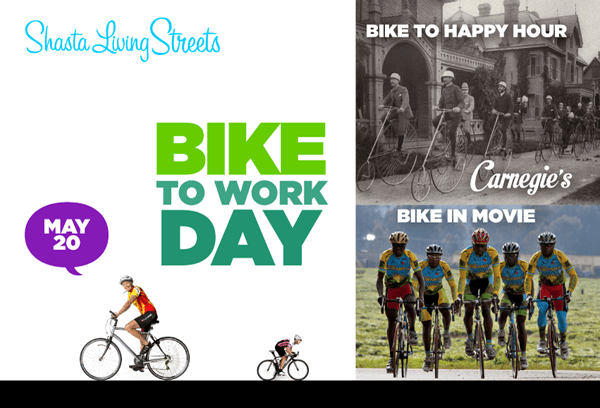 Also, Bike to Work Day/Week/Month is a great way to get people to try riding. People don’t want to be left out of the fun, and biking is usually such a quiet, almost invisible activity. Today is a day to get out there and make some great big public celebratory noise about riding a bike. Below are some photos and some highlights of the goings on around California. Send more photos to melanie@streetsblog.org and we’ll post them here. 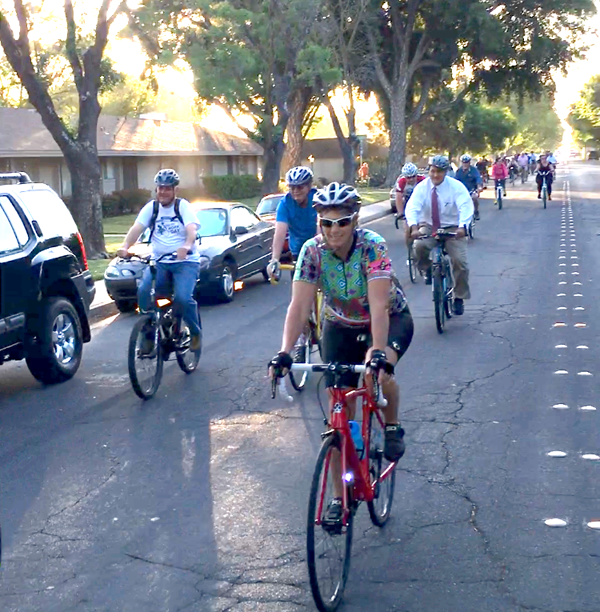 MODESTO held a Bike with the Mayor ride into work this morning, followed by a free breakfast for those who rode their bikes to work. One of the stops in the Amgen Tour of California passed through Modesto yesterday, so the city held a Cycling Expo with bike repair, food trucks, and a chance to talk to some of the Tour luminaries. And on Saturday the city will celebrate bikes with a Family Cycling Festival and Criterium on I Street, between 10th and 12th streets, with vendor booths, BMX bike demos, and races, plus the Stanislaus County Bike Club will lead a Community Bike Ride along the new bike lanes connecting the two college campuses. SAN LUIS OBISPO COUNTY‘s Bike to Work Day will be held tomorrow, May 20. 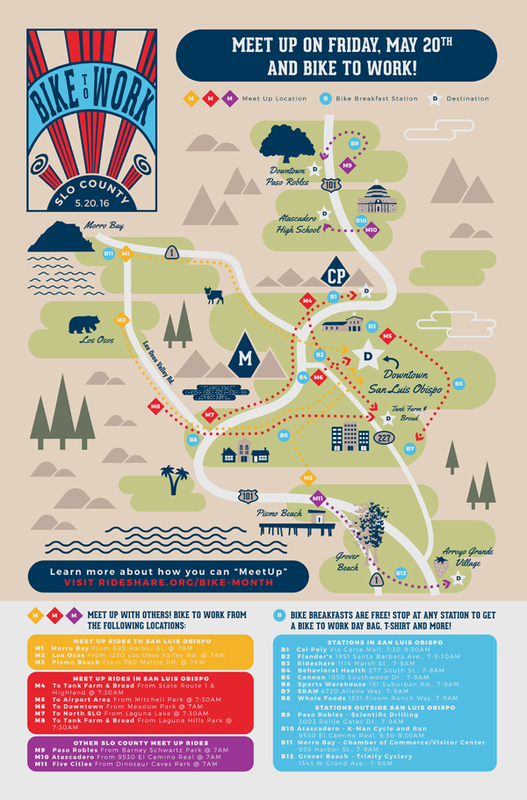 Not having a bike is no excuse not to participate, because the County’s RideShare will set you up with a free rental bike for the day, upon request here. 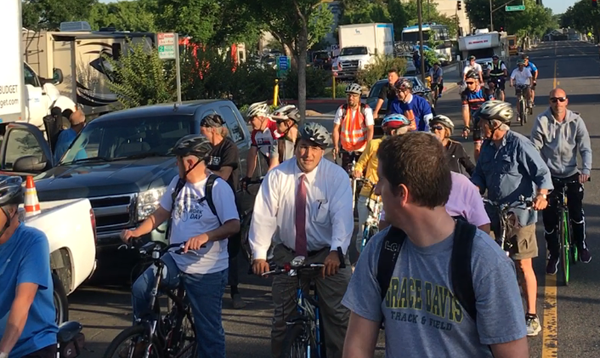 Caltrans led a tour last week through the city of San Luis Obispo to show off new bikeways and talk about upcoming improvements. 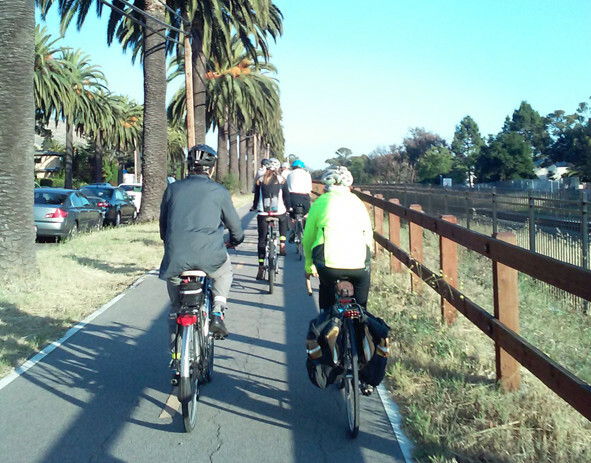 SLO’s Bike to Work Day celebration also includes the usual: Bags and other free stuff for people who ride, a chance to win a bike in a raffle, a competition for the most miles ridden, and free breakfast all week for bike riders. There is also a Bike to Work Day After Party on Friday evening, with more free stuff for bike riders. 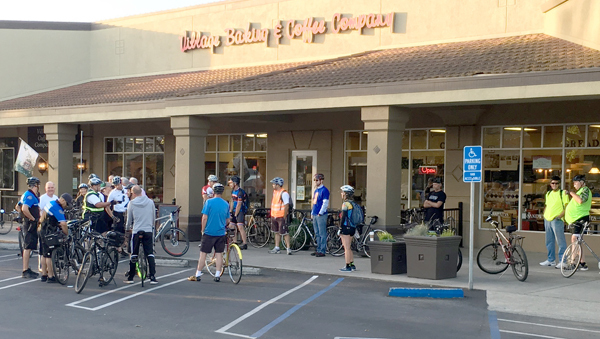 REDDING‘s Bike to Work Day—the amazing start to a new habit!—will happen tomorrow, May 20, starting off with a free breakfast for bike riders. It includes a Bike to Happy Hour (Carnegie’s, starting at 4 p.m.) and a Bike-In Movie (8 p.m. in the Promenade in downtown Redding). The Mayor and other local dignitaries will talk about creating a bicycle-friendly Redding, followed by a screening of Rising From the Ashes. Redding is also holding a “Bike with a Transportation Official” ride tonight at 5:30 p.m. (meet at the Sundial Bridge). The ride will preview planned improvements to the downtown bicycle network. LOS ANGELES AND ENVIRONS, INCLUDING SANTA MONICA, celebrate Bike to Work Day today with free rides on Metro and Metrolink for people who ride their bikes to transit, either bringing their bikes on board (or onto the bike rack) or locking at the station. 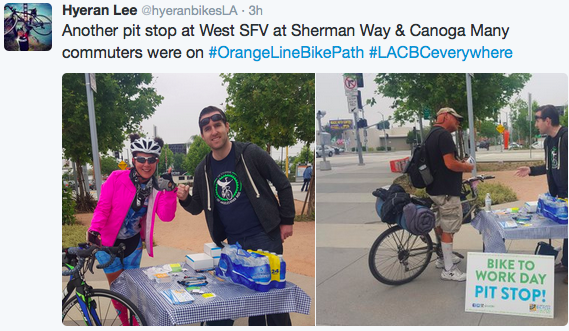 LA County also hosted Bike to Work Day Pit Stops, with refreshments and cheers for bicyclists (map here). A Bike from Work Handlebar Happy Hour will be held at Angel City Brewery tonight from 5 to 8 p.m. (details here). There are two Handlebar Happy Hours in Santa Monica, one at Areal (2820 Main Street) and one at Public Bikes (2714 Main Street). They’re close enough you can attend both. Actually, Santa Monica has been holding one of these every Thursday in May; details here. And next week, on May 27, Bike Night at Union Station will be hosted by the OTIS School of Fashion and Design, with live music, food, raffles, and a bike fashion show. PASADENA held a morning event today at City Hall that included snacks, free stuff, raffle prizes, free bicycle tuneups and the Pasadena Fire Departments bicycle paramedic team. 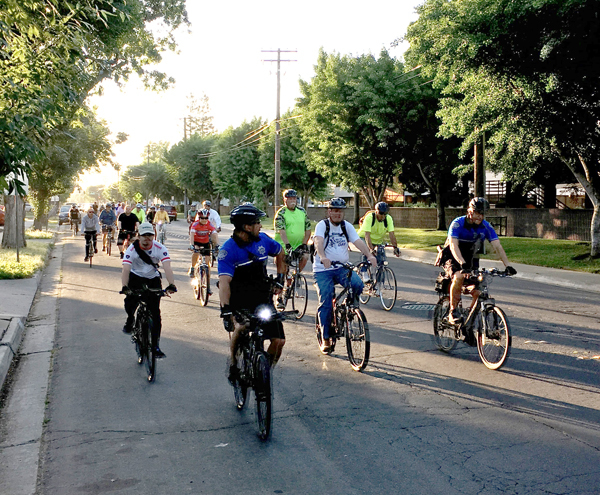 Other events in Pasadena: A Shift After Work Party, from 6:30 to 9 pm tonight at Incycle (175 S. Fair Oaks Avenue); Bike-in Movie Night from 7 to 11 pm at the Caltech Y (505 S. Wilson Avenue); and on Saturday, Pedal Party will wrap up Bike Week with a group ride through Pasadena (details here). What’s happening in your area? Let us know in the comments below. Well Shift after Work packed up at 7 pm sharp – I got there a few minutes after and they were throwing out the ice. Boy glad this day is over! Now we can get back to driving the other 364 days, right? Ok, this is even funnier considering I passed by Pasadena City Hall and saw nothing. My experiences were… I would have had no idea it was bike to work day if I didn’t read about it online. I saw absolutely nothing going on. Supposedly I passed some pit spots, but I didn’t see them with my own eyes. 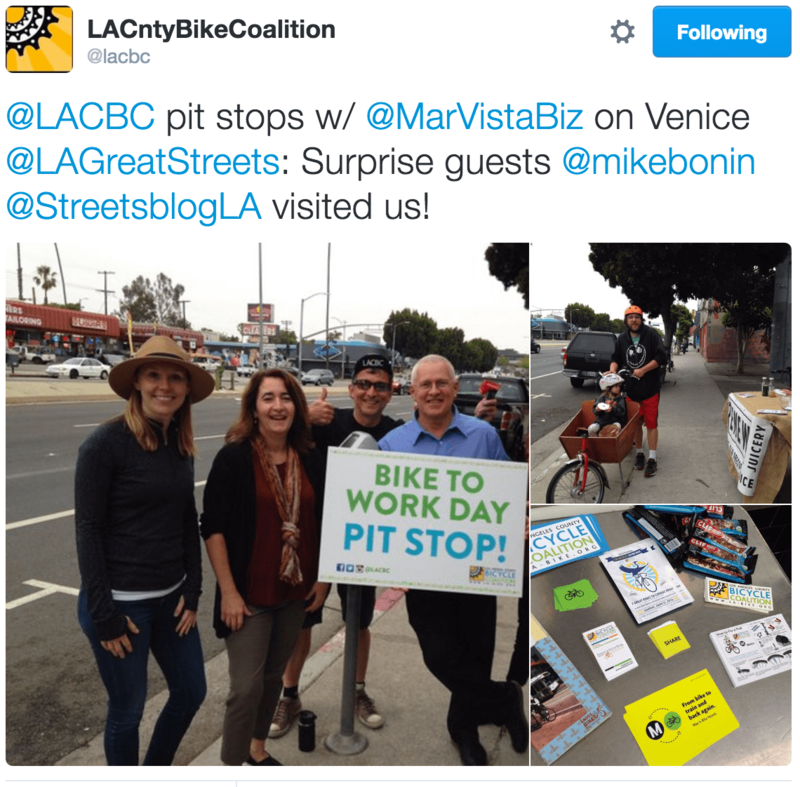 Mayoral candidates campaigned to their biking constituencies.